An elite athlete and a member of the Australian paratriathlon team that participated in the 2016 Rio de Janeiro Paralympics, Brant takes on the challenges being both a Paralympian and a professional speaker bring. He has shown time and again that whatever obstacles life throws at you, they can be overcome. Brant is guaranteed to inspire any audience through his recollection of challenges faced and achievements won. He is open and affable, making him an ideal presenter for any function. Brant Garvey’s passion for the pursuit of excellence in life and sport is equaled only by his desire to educate and inspire others to do great things in their lives. He is dedicated to helping others to develop the tools they need to face their fears, overcome their obstacles and to chase big dreams. Brant lives to push the boundaries of what is possible and he thrills audiences with stories that are relatable to adults and children from all walks of life. A seasoned speaker who has the innate ability to make a connection with each audience member, Brant translates the lessons he’s learned in the pursuit of excellence to meaningful and valuable lessons for your guests and event attendees. Stories of resilience, dedication, commitment and chasing big dreams translate seamlessly to the workplace, the sporting team, family life or school environment and are tailored according to your event’s objectives. Born as an above knee amputee, Brant’s unique life experiences, indomitable positivity and a “noXcuses” mindset have led him to outstanding achievements time and time again. 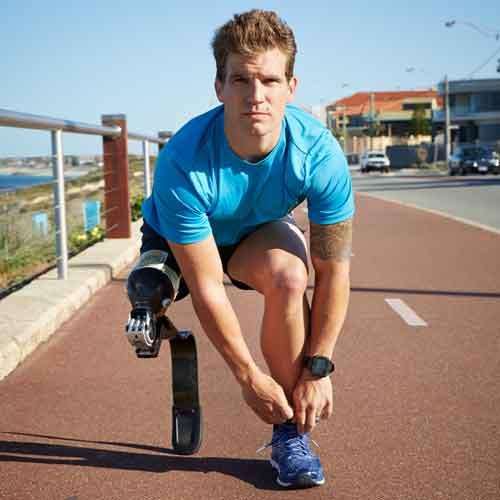 Whether it’s the multiple first place finishes at paratriathlon world championships around the world or it’s when he was the first above knee amputee to complete an Ironman Triathlon in Australia, Brant’s stories motivate and create change. Brant’s demonstrable influence and impact throughout his career has motivated athletes and non-athletes around the world to dream big and achieve their goals. Your guests will discover the secrets to remaining resilient no matter the situation they face, as Brant delivers a powerful presentation which resonates with actionable learnings. Sector experience includes sports, entertainment, corporate, oil and gas, mining, mining services, education, and not for profit.